VANCOUVER -- A notorious character with prior run-ins with Vancouver Police briefly snatched a knife from a crime scene this week, but the cops aren't recommending charges. 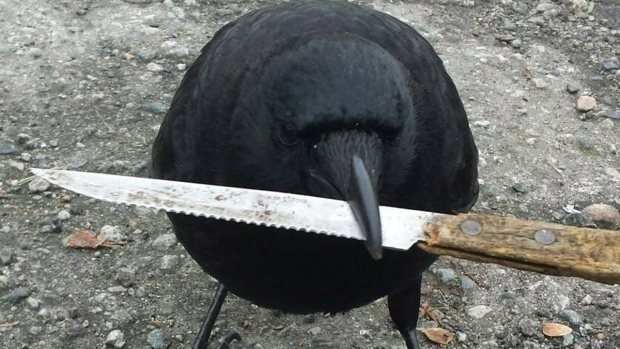 That's because the knife thief is believed to be Canuck the Crow, an infamous local bird that was raised by humans and has more than 13,000 Facebook followers. The incident unfolded after police shot and wounded a man near an East Vancouver McDonald's on Tuesday, prompting media, including Vancouver Courier reporter Mike Howell, to race to the scene. "I saw this crow swoop in and grab some sort of object, and then start to fly away with it," Howell said. "Then the cop started to give chase in the parking lot, and then about, say 15, 20 feet later, the crow dropped what turned out to be a knife. Vancouver Police said officers were called to the scene of a burning car in the parking lot. Officers were confronted by a man with a knife, shots were fired and the man was arrested, police said. Const. Brian Montague confirmed that a bird picked up a knife and tried to fly away before it was chased by officers. The knife was eventually gathered as evidence. Montague said it's not the first time the department has encountered Canuck. An officer took a photo of the feathered foe in April when it flew into a police cruiser and stole a button from the keyboard of an on-board computer. 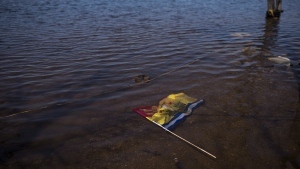 "No planned press conference or 'wanted' poster," Montague said in an e-mail. Despite the bird's tendency to tamper with police evidence and equipment, a Facebook page devoted to Canuck describes him as a popular -- if sometimes difficult -- fixture in the area of Cassiar Street and Hastings Street, near the Pacific National Exhibition. "He's met so many people and had so many experiences with them. He likes who he likes and he doesn't like who he doesn't like. He is a wild crow after all. But I do think he likes getting his picture taken," the page says. The page says the bird was found as a hatchling that had fallen from a nest. A resident raised Canuck until he was able to fly, before setting him free with the red zip tag around his leg so he could be easily identified. Howell said he has probably received more Twitter activity about Canuck over the past few days than anything else he's ever reported on, but he noted that the story he wrote on Tuesday focused on the police shooting. "I didn't want to be insensitive to the story that police actually shot a man in a parking lot," he said, adding that police shot and killed a different man in the same parking lot in 2012. "There's all these elements there, like, 'What's my lead? Do I lead with the crow? He just picked up a knife and dropped it.' But everybody's more interested in the crow than they are about the guy being shot by police."